Sticky Toffee Pudding seems just the sort of thing to have been around for centuries, right? It is a British classic all right, but a modern British classic. There are those who will tell you it originated in Cumbria, others Lancashire, and still others Scotland or Canada. Despite some talk of it having been brought to Britain by a Canadian soldier during World War Two, the earliest publication date of a recipe seems to be 1971 in Britain. Since I have grandparents from both Cumbria and Lancashire, I'd be tempted to claim that connection, but they emigrated to Canada long before then and likely never had sticky toffee pudding. It can be baked in a cake tin and cut into squares or wedges for serving, but I prefer to make individual puddings. Since it is a very rich and sweet dessert (though my version might be less sweet than most), the standard-muffin-tin-size pudding makes a very satisfying portion. I love that it is something you can make a day or two ahead (probably even longer). Just place as many warm puddings as you will be serving in a baking dish; you can fit as many as 15 in a 13x9x2-inch baking dish. 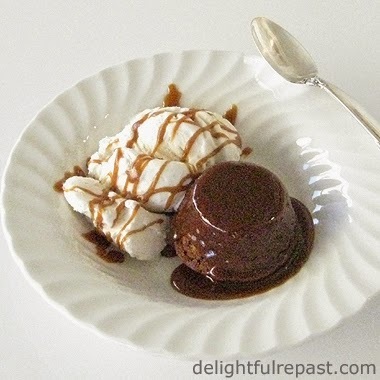 Spoon a tablespoon or two (depending on how thick you make it) of warm toffee sauce over each warm pudding. Cover the dish with foil. If you've just made them a few hours ahead, you can leave the dish on the counter. Otherwise, refrigerate until you're ready to reheat the puddings. Reheat for about 20 minutes in oven preheated to 350 degrees. I rarely serve dessert to 18 people, so it's a good thing the puddings freeze well. 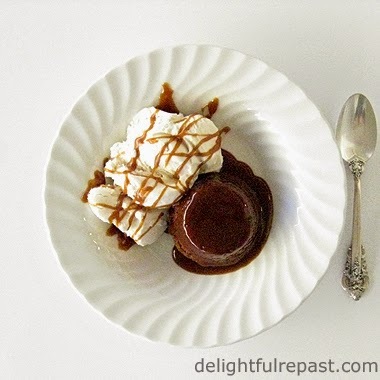 What is your favorite classic comfort food dessert? 1 In 1-quart saucepan, bring dates and water to a boil. Boil gently for 3 minutes. Remove from heat, stir in baking soda and set aside. 2 Preheat oven to 350F/180C/Gas4. Grease a 12-cup standard muffin tin and a 6-cup standard muffin tin. Place them on a half-sheet pan. 3 In small bowl, whisk together flour, baking powder and salt. In a medium bowl, by hand or with electric mixer, cream together butter and brown sugar. Beat in eggs, one at a time, and vanilla extract. Add flour mixture and beat on low speed until well combined. 4 In food processor fitted with chopping blade, process dates in their liquid to a smooth puree. Add date mixture to batter and stir until combined. 5 Using a 1/4-cup measuring cup, divide batter evenly between the 18 muffin cups. Bake for about 18 to 20 minutes, or until a toothpick inserted in the center comes out clean. Turn out onto wire racks, top sides down. 6 While puddings are baking, make the sauce. (Or make it ahead and leave it at room temperature for a few hours before gently rewarming it at serving time.) In 2-quart saucepan, combine dark brown sugar, butter, cream, salt and molasses. Bring to a boil over medium heat and cook, stirring occasionally, for 5 to 10 minutes, depending on the consistency* you prefer. 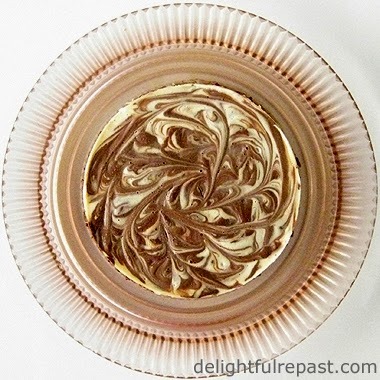 Remove from heat and stir in brandy, if using, and vanilla extract. * I like to stop at 5 minutes and spoon a little of the thinner sauce over the warm-from-the-oven puddings, then continue cooking the remaining sauce until it is thicker, about 5 minutes longer. Not necessary, but I like the way the thinner sauce kind of soaks into the puddings a bit. 7 Place puddings on individual serving plates. Spoon sauce over the puddings. Add a scoop of vanilla ice cream or barely sweetened whipped cream on the side. And, of course, Custard Sauce - Creme Anglaise takes this dessert completely over the top! As I said two weeks ago, Slow Cooker Cheesecake is the only way to go! Not only is it so very easy, it doesn't heat up the kitchen while it slowly bakes and, most important of all, it comes out with a superb texture and no cracking. This week I thought I'd do a version for chocolate lovers. Since I'm not one, I didn't want to make it completely chocolate. So I decided on a Slow Cooker Chocolate Swirl Cheesecake with a chocolate crust. Not wanting to run out to the store to buy chocolate wafers, I developed my own version of chocolate crumb crust using regular graham crackers and a little cocoa. Of course, you don't have to use organic ingredients, but I always do. I figure it's one way I can take care of our health and do my bit for the planet. Just 5 simple ingredients for the crust and 6 for the filling. I have a 6-quart oval slow cooker with a wire rack. If yours is round, that's okay, too. If yours doesn't have a wire rack, make a ring of aluminum foil to set the pan on. There's always a way! What kind of cheesecake do you like, and is there a kind you would like a recipe for? I take requests! 1 Butter bottom and sides of a 7-inch springform pan with the softened butter. Cut a circle of parchment paper to fit the pan, press it in the buttered pan, then turn it over and press it into place. Combine crumbs, sugar, cocoa and melted butter until the mixture comes together. If you used a food processor to make the crumbs, you can mix the crust in it as well. If you used your fingers or the rolling pin/plastic bag method to make the crumbs, you can mix the crust with a fork in a small bowl. Press the crumb mixture evenly and firmly over the bottom of the pan. 2 With electric mixer on medium speed, mix cream cheese, sugar and vanilla until perfectly smooth, about 2 minutes. Scrape the bowl and beaters/paddle. Add eggs, one at a time, mixing well after each addition. On low speed, mix in sour cream just until well combined. Remove 3/4 cup of the cheesecake batter; set aside. Pour half the remaining batter into the prepared pan. 3 Stir together the reserved 3/4 cup of cheesecake batter and the melted and cooled chocolate until thoroughly combined. Place spoonfuls of the chocolate batter on top of the filling in the pan; pour the remaining half of the batter into the pan. Place spoonfuls of the remaining chocolate batter on top of the filling in the pan; cut through batter several times with a knife to make swirls (being careful not to disturb the crust). 4 Place rack in bottom of cooker, and add water to just below the rack (that's about 2 1/2 cups in the Cuisinart MSC-600 Multicooker). Set the cheesecake on the rack. Cover the slow cooker with a triple layer of paper towels and the lid. (The paper towels will prevent condensation falling from the lid onto your cheesecake.) Set to Slow Cook on High for 2 hours; do not lift lid. Turn off the heat and let stand for 1 hour; do not lift lid until the hour is up. 5 Remove the lid and paper towels, and remove cheesecake to wire rack. Carefully run a knife around the edge of the cheesecake; cool for 1 hour. Run the knife around the edge again and remove the sides of the pan. Cover and chill for at least 6 hours (or up to 3 days) before serving. 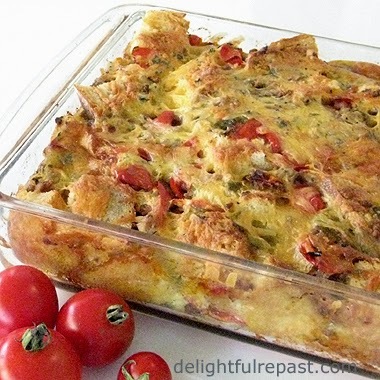 Overnight Breakfast Casserole makes a nice change from the usual breakfast fare, and it can be assembled the evening before. 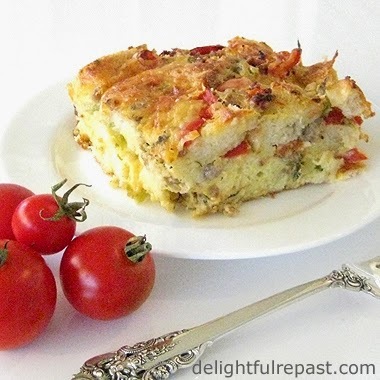 Making an Overnight Breakfast Casserole means you can be a guest at your own breakfast! I love getting all the mess out of the way the night before. Just take the casserole out of the refrigerator an hour before baking, preheat the oven and bake for 45 to 55 minutes. To make 8 servings, just double all ingredients and use a 13x9x2-inch baking dish. I came up with this for my latest Limey Day (and before you get your knickers in a twist, I am not using the term "Limey Day" in a pejorative way--one of the husbands, a bit of an Anglophile himself, came up with it). It's the day every three months when three of us (sometimes we invite a fourth) get together for a day of British films and television. And we do make a day of it, going from 10:30 am to about 6:30 pm. Of course, all that viewing time is broken up by lots of chinwags and food. I always try to have a British theme for the food. Like this Shepherd's Pie. Tea and scones, of course. I was in charge of breakfast this time and thought, "How can I have a British-themed breakfast without standing at the stove doing the Full English?" Answer: a savoury bread and butter pudding! Note: If making more than an hour or two ahead, it is especially important to use a sturdy bread, such as an unsliced round Italian loaf. Preheat oven to 400 degrees. Cut 3/4-inch slices, arrange on a baking sheet and toast in oven for about 10 minutes on each side to dry it out a bit. Cool before buttering and cutting. 1 Spread the bread slices on one side with softened butter. Stack and cut into about 1-inch squares. 2 In 1-quart bowl, whisk together eggs, milk, parsley, salt, pepper, marjoram and red pepper flakes. 3 Butter an 8x8x2-inch baking dish (a 13x9x2-inch baking dish, if doubling the recipe). 4 Put a third of the buttered bread cubes in the casserole. Sprinkle with a third of the sausage or bacon, tomatoes, chiles and cheese. Pour on a third of the egg mixture. Repeat twice. Press it down evenly, cover with plastic wrap and refrigerate overnight. 5 Take casserole out of refrigerator 30 to 60 minutes before baking. Preheat oven to 350 degrees. Bake casserole at 350 degrees for about 45 to 55 minutes, or until puffed and golden and a knife inserted in the center comes out clean. Slow Cooker Cheesecake is the only way to go! People tend to make a production out of cheesecake, but it doesn't have to be. Just bring a few simple ingredients to room temperature, mix them up, assemble, put it in the slow cooker and forget about it. I made a simple strawberry topping for this one, but it is perfectly fine without it. 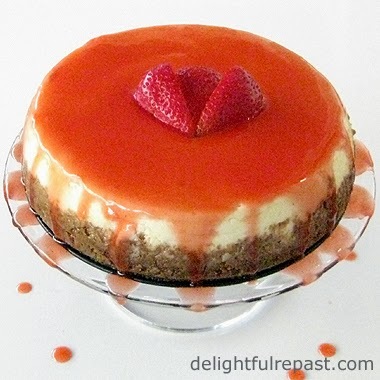 There are lots of ways to go with this basic recipe, so I expect you'll be seeing more slow cooker cheesecake recipes here at Delightful Repast in the next few months. The 7-inch diameter makes for the perfect size servings of something so rich as cheesecake. The more typical 9- to 10-inch size pans make either huge servings or very skinny, long wedges that aren't very attractive. We love the texture of this cheesecake. And it did not have the common cheesecake problem of cracking on top. How do you feel about cheesecake? It seems to be one of those things people either love or hate. 1 Butter bottom and sides of a 7-inch springform pan* with the softened butter. Combine crumbs, sugar and melted butter until the mixture comes together. If you used a food processor to make the crumbs, you can mix the crust in it as well. If you used the rolling pin/plastic bag method to make the crumbs, you can mix the crust with a fork in a small bowl. Press the crumb mixture over the bottom and one inch up the sides of the springform pan. * If you want to remove the cheesecake from the springform pan base to serve, cut a circle of parchment paper to fit the buttered bottom of the pan, then butter the top of the paper as well. Note: I use the Progressive International 3-Inch-Deep 7-Inch Nonstick Springform Pan, which I didn't find on Amazon except in this Set of 3 Springform Pans. 2 With electric mixer on medium speed, mix cream cheese and sugar until perfectly smooth, about 2 minutes. Scrape the bowl and beaters/paddle. Add eggs, one at a time, mixing well after each addition. On low speed, mix in vanilla and sour cream just until well combined. Pour cheesecake filling into prepared pan. 3 Place rack in bottom of cooker, and add water to just below the rack (that's 3 cups in the Cuisinart MSC-600 Multicooker). Set the cheesecake on the rack. Cover the slow cooker with a triple layer of paper towels and the lid. (The paper towels will prevent condensation falling from the lid onto your cheesecake.) Set to Slow Cook on High for 2 hours; do not lift lid. Turn off the heat and let stand for 1 hour; do not lift lid until the hour is up. 4 Remove the lid and paper towels, and remove cheesecake to cool on wire rack for 1 hour. Carefully run a knife around the edge of the cheesecake. Release the spring and remove the sides of the pan. Cover and chill for at least 6 hours before serving.